Local University of the Third Age (U3A) members are opening their minds and hearts to Murdoch University students, offering a mentoring program. 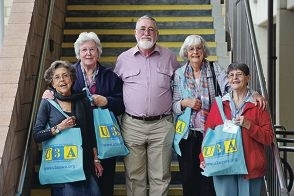 U3A is open to anyone over the age of 50, who enjoys learning and making new friends with similar or the same interests. Group member Wendy Meacham said it was wonderful to be able to pass on knowledge to younger generations. ‘We don’t have any students involved in the mentoring program this semester yet, but we think it is a nice way to bring the community together,’ she said.